Installation artist Simon Starling, winner of this year's £25,000 Turner Prize, recycles objects by reframing and reforming them. He was born in Epsom, Surrey, and studied at Trent Polytechnic, in Nottingham, and Glasgow School of Art. He lives and works in Glasgow and Berlin. The artist has said he is fascinated by the processes involved in "transforming one object or substance into another", exploring ideas about nature, technology and economics. Explaining Shedboatshed, in which he transformed a shed into a boat, paddled it down the Rhine and then turned it back into a shed, he said: "It's a bit of mobile architecture. Starling said Shedboatshed was "a bit of mobile architecture"
"It's an attempt to make an artwork, which is very ergonomic and easy on the environment. It's a very simple idea." He added the artwork was about "slowing things down, about trying to retard this incredible speed at which we live". 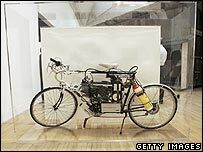 His other artworks include an electric bicycle he built and rode across the Spanish desert. The water produced by the bicycle was then used to produce an accompanying cactus painting. And in 1997 project he made a bicycle from aluminium parts taken from a Charles Eames chair. For a 2002 exhibition, Starling placed a car engine in a gallery and ran it continuously to provide enough heat for a cactus to survive. He has had solo exhibitions at the Modern Institute in Glasgow and Fundacio Joan Miro in Barcelona, as well in New York, Nice and Frankfurt. 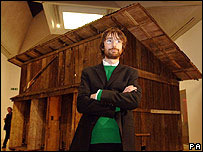 He and fellow Turner nominee Jim Lambie were part of the team that represented Scotland at the 2003 Venice Biennale. Starling used the subject of rhododendrons which threaten the Scottish environment. His future work plans include throwing a replica Henry Moore sculpture into Lake Ontario. "Zebra mussels have been introduced into the lake and they are taking over and transforming the ecosystem," he said. "There is a Henry Moore sculpture in Toronto called Warrior With A Shield so I thought it would be nice to throw it into the lake, leave it for six months, grow lots of mussels on it, then hang it in a gallery."